Anna Esthetics is pleased to introduce you to Christina’s specialized skincare solutions addressing a wide range of skin conditions for qualified skin professionals and their customers worldwide, promoting clear, healthy and younger looking skin. Christina develops specialized skincare solutions addressing a wide range of skin conditions for qualified skin professionals and their customers worldwide. Christina assures an improved skin texture for various conditions including aging skin, hyperpigmentation, oily & combination, acne and acne damage. 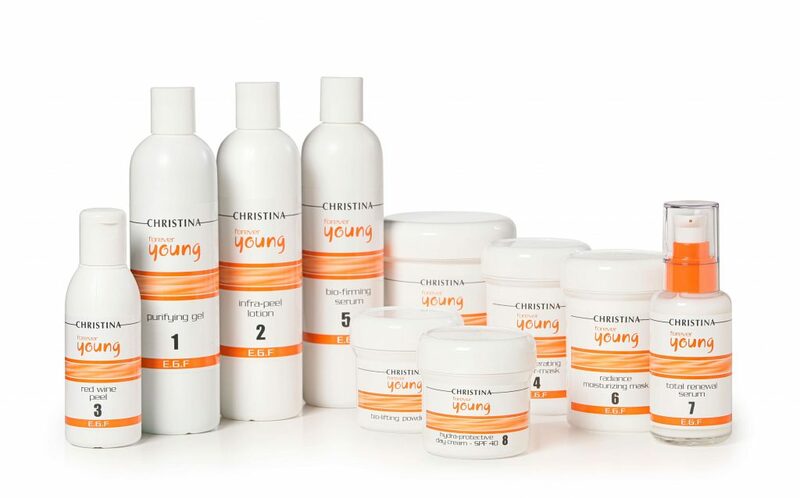 Christina professional skincare solutions facilitate an ongoing process to treat and prevent skin conditions. The products are more effective because their active ingredients are scientifically able to penetrate the skin, and are provided in optimal quantities for best results. Christina achieves this without using harmful penetration enhancers commonly found in other salon treatments. Instead, Christina relies on scientifically advanced solutions, innovative mixtures and optimal levels of active ingredients combined with desired chemical reactions to increase penetration and efficacy without creating any undesired side effects. All of Christina’s in-salon and home treatments are designed in user-friendly easy-to-follow step-by- step instructions. 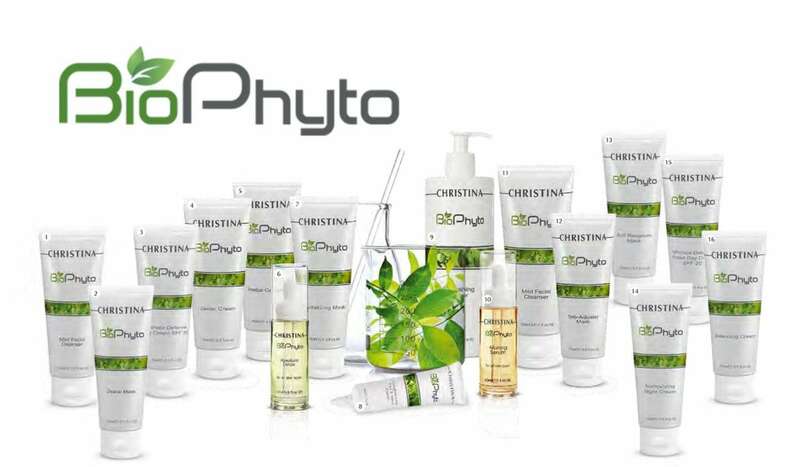 BioPhyto is where science meets nature to create products with unique qualities and outstanding results in lighting off damage done to the skin. The skin will appear impressively radiant, vibrant and revitalized. BioPhyto products enhance cellular performance by prompting essential processes. The series main focus is on providing customized solutions to an array of adverse skin manifestations. Any skin that was affected by endogenous factors or was exposed to prolonged smoking, medication, damaging environmental pollutants can be successfully restored to a healthier, more radiant and revitalized appearance. A gentle non-drying gel washes away oil and make-up residue and impurities. Soothes manifestations of discomfort, and leaves the skin feeling clean and comfortable. Treatment toner based on botanical ingredients. Purifies and tones while removing excess sebum. Does not dry, but leaves the skin well hydrated, feeling clean and refreshed. A light gel softens and improves skin flexibility. Loosens pores for easy extraction of comedones without feeling discomfort, and is an ideal optimizer for ensuing treatments. A luxurious combination of plants, innovative actives and BHA creates strong sensations of cold and warm. Detoxifies, eliminates excess sebum, toxins and damaged cells. Promotes micro-circulation and micro-capillary flexibility for effective delivery of oxygen to cells, supports surface cell turn-over and strengthens defense properties. Prevents breakouts. It is a powerful enhancer of healthy and beautifullooking skin. A fortified, unique combination of plants, innovative actives and BHA creates strong sensations of cold and warm. Detoxifies, eliminates excess sebum, toxins and damaged cells. Promotes micro-circulation and micro-capillary flexibility for effective delivery of oxygen to cells, supports surface cell turn-over and strengthens defense properties. Prevents breakouts, and is a powerful enhancer of healthy and beautifullooking skin. An optimal combination of alpha & beta acids and botanicals for follow-up treatment, promotes cellular respiration and cell regeneration. Dramatically corrects areas affected by hyper-keratinization. Treats different skin conditions and prevents further damage. The complexion appears brighter, smoother with visibly improved texture. A silky repair cream combining nourishing ingredients enriched with vitamins. Replenishes and hydrates, rebuilds the skin barrier, strengthening and protecting against further damaging agents. Helps improve texture and elasticity. An astringent mask that modulates and reduces excess sebaceous secretion and excretion. Inhibits the 5-alpha reductase enzyme, reduces the appearance of enlarged pores, diminishes and blurs blemishes. An ultimate treatment combination of botanicals and innovative actives with antikeratinization properties. A potent antioxidant, promotes skin regeneration and protection. Treats flaky skin, soothes irritations, diminishes inflammations caused by aggressive cosmetic devices treatments or environmental factors. An optimal combination gives the delicate areas an unprecedented treatment. Protects, reducing the visibility of puffiness and dark circles. Reinforces elasticity and micro-capillarity, restores a more luminous and healthier look. Comprehensive and long lasting, Forever Young salon and home use products deliver proven results that protect, rejuvenate and support overall healthy and youthful looking skin. The Forever Young anti-aging formula utilizes powerful scientifically advanced micro- biomimetic polypeptides to fortify the skin’s natural repair functions, strengthen protection and rebuild tissue. Skin-saving botanicals and other essential ingredients encourage cellular regeneration and correction such as proteins, sea-derived albumins, vitamins, minerals, oligo elements, antioxidants, tannins, moisturizing agents, fruit acids and herbal extracts. This oil-alcohol-free Purifying Gel relies on natural, active ingredients such as Saponaria and Quillaja extracts to gently, yet thoroughly, cleanse the skin and remove regular and waterproof makeup, environmental pollutants and oily residue. The tannin-rich formula tightens skin and begins the firming process from the very first application. Based on a rich combination of 8% alpha-hydroxyl acids, glycolic acid, lactic acid, and natural soaps Quillaja and Saponaria, the Exfoliate Infra-Peel Lotion prepares the skin for the peeling process. The unique formula opens pores to ensure adequate absorption of the active ingredients in the following steps. Alpha-hydroxyl acid and an innovative combination of melanin-blocking, lightening agents, vitamins and natural plant extracts polish away dull, lifeless skin for a light, radiant glow. The advanced formula stimulates blood flow, thereby enriching cells with oxygen to rebuild Collagen and Elastin for increased elasticity and radiance. *The Forever Young Forte Peel was developed with the intention of replacing the product line’s peel – Red Wine Peel, when skin’s condition requires it. This Regenerating Under Mask contains goat-whey-almond-derived milks and is enriched with phytosterols and growth factors to firm, tighten and moisturize the skin. The innovative ingredients increase skin cells’ metabolism activity and turgor pressure, infusing moisture and creating pressure to fill wrinkles from the inside for firmer, generally younger-looking skin. The mask, a base for Step 5: Bio-lifting Powder and Bio-Firming Serum, is also enriched with Epidermal Thymic Factor (ETF) Acetyl Pentapeptide-1 and G.F. Peptide for tissue renewal. The Bio-Firming Serum contains wild thyme, lupin, seaweed and hydrolyzed wheat protein for firming, flavonoids, tannins (astringents), Epidermal Thymic Factor (ETF) Acetyl Pentapeptide-1 and G.F. Peptide for stimulating keratin and fillagrin synthesis, fortifying skin’s defense mechanisms and smoothing skin. The innovative 2-part formula was designed for simultaneous use to support the peeling process within the skin and deliver a long-lasting tightening effect. It combines structural proteins, albumins, natural fruit-based sugars, cholesterol and oligo elements for multiple anti-aging benefits. This non-oily, transparent Radiance Moisturizing Mask provides maximum hydration, saturating skin with vitamins A, C and K, plus beta-carotene for antioxidant photoprotection. Five advanced biomimetic peptides protect against and reverse the signs of aging: Epidermal Thymic Factor (ETF) Acetyl Pentapeptide-1 to increase keratin and fillagrin synthesis, G.F. Peptide for tissue renewal ; Fibronectin Biomimetic Peptide to enhance cell adhesion and epidermal repair; Dermostatyl-DM to suppress melanin discoloration; and Phytocohesine PSP to hydrate and regenerate the skin barrier. This innovative Active Firming Algae Mask stimulates cell vitality and the renewal of firming tissues while balancing epidermal moisture. The advanced formula features Spirulina seaweed with optimal levels of powerful amino acids and proteins for fresh and supple, younger looking skin. Anti-Puff Eye Mask (optional) This unique mask designed to treat the sensitive eye contour features an innovative blend of eye-defining active ingredients. Marine collagen smoothes wrinkles, tightens skin and reduces puffiness, while rice powder together with algin create a soft filmbinding cells and strengthening the skin’s natural barrier against impurities and environmental pollutants. This advanced, 80%-moisturizer, concentrated serum penetrates the skin to the cellular level for maximum, long-lasting action and renewal. This innovative formula features powerful active ingredients including Epidermal Thymic Factor (ETF) Acetyl Pentapeptide-1 for stimulating keratin and filaggrin synthesis and G.F. Peptide for tissue renewal and restoration of the skin’s biomechanical properties. Glycerin gently moisturizes the skin while Polysilicone-11 fills wrinkles and reflects off the skin surface for an instance smoothing effect. Formulated to deliver long-lasting hydration and protection without heaviness or clogging, the noncomedogenic Hydra-Protective Day Cream relies on a unique combination of high SPF, UVA/UVB filters and advanced cellular- level skin rebuilders to reduce and prevent the signs of aging, protecting skin against sun radiation and free radicals. Powerful active ingredients including Epidermal Thymic Factor (ETF) Acetyl Pentapeptide-1 increase keratin, fillagrin synthesis and G.F. Peptide for tissue renewal and restoration of the skin’s biomechanical properties. Fluoroxygen+C is a multidirectional treatment for skin hyperpigmentation and photo damage. It lightens visible epidermal layers, while regulating melanin production in the deeper dermis while rejuvenating the skin. In combination with its home use products, Fluoroxygen+C provides long-term protection against biological and environmental factors that cause discoloration. Excessive sun exposure, Melasma, genetics, post acne damage and melanocyte hyperactivity are some of the factors that can have devastating effects on skin complexion. Brown spots or skin patches are caused by a number of internal and external factors. Fluoroxygen+C uses a unique approach, simultaneously treating visible damage in the upper skin layers, and slowing the production of pigmentation at its source to put a stop to discoloration. The Clarifying Scrub with its combined natural ingredients such as Quillaja Saponaria and Saponaria Officinalis with Salicylic cleanse and remove dead skin cells without irritating or drying the skin, leaving it revitalized and ready for the Balancing Toner. The Balancing Toner prepares the skin for peeling by decreasing pH levels (pH 4.0) and testing the skin’s sensitivity to Glycolic Acid. The blend of natural lighteners and calming agents ensure skin is smooth, clean and prepared for the next step. The innovative combination of Alpha-hydroxy acids and Melanin-balancing lightening agents, vitamins and natural plant extracts of the Exfoliator removes dull skin, promotes cellular egeneration and increased blood circulation. The Exfoliator fortifies the skin’s metabolism, stimulates fibroblasts to increase Collagen and Elastin synthesis for enhanced elasticity and a youthful complexion. This lightening and brightening peel contains a high percentage of active ingredients, assisting in the shedding of dead skin cells and revealing a fresher, clean look. Ingredients like Criste Marine fennel and citric acid exfoliate while reducing tyrosinase stimulation, minimizing the appearance of discoloration, fine lines, wrinkles, and scars. The peel purifies and cleans both within and on the surface, helping prevent further blemishes without causing irritation. Skin is revitalized and brims with moisture. Due to its unique powder form, this enzymatic blend retains a high concentration of Vitamin C (30%), ensuring its stability and activity for a long period of time. This formula maximizes the effects of Vitamin C, increasing its ability to penetrate deep into the skin to lighten, firm and rejuvenate. With pH 8, it neutralizes alpha-hydroxyl acids upon contact and regulates the skin’s pH while Witch Hazel tannins astringe and close pores for soft, supple, balanced skin. This alkaline pH Rebalancer calms erythema and irritation that can develop after exfoliation, neutralizing Alpha-hydroxyl acids on contact and balancing pH levels while natural astringents contract cleansed pores resulting in a soft, supple skin. The Isotonic Marine Mist uses high concentrations of natural Magnesium found in the Dead Sea to instantly hydrate and lock in moisture. The special Dead Sea mineral formula soothes and moisturizes by boosting the moisture capacity of Natural Moisturizing Factors. The Soothing and Bleaching Mask nourishes skin with vitamins and minerals including Magnesium and Calcium. The moisturizing properties of the mask enhance the antiaging affect by rejuvenating and lightening. The final step in the treatment, the Pure Vitamin C Algae Mask infuses skin with high levels of vitamins C, PP and A to fight free radicals while stimulating collagen synthesis. The mask provides anti-aging results by correcting and lightening hyperpigmentation, providing effective anti-aging properties: decreases puffiness, moisturizes and smoothes skin texture.